The season kicked off in style with Wigan drawing and Warrington and the Saints winning on the opening weekend. Widnes dramatically fought back to earn a draw against Wigan that nearly seemed like a win to the Vikings. The first day of the season started with a draw, Wigan were way ahead at the half but the Vikings ferociously fought back in style. 16 - 8 was the score to the Warriors at the end of the first forty, but yet again Widnes have fought off one of the big gun teams. 16 - 0 was the outcome thirty minutes in, that was slipped away. Josh Charnley and Luke Tomkins were the players to watch, surprisingly none of the two scored a single try! Joel Tomkins, Brother of Luke scored and then Joe Burgess got back to scoring ways to seal the win but no, Widnes still had fight in them! The Saints kicked off their title defense of the Super League crown with a Well-deserved win over the Catalan Dragons. The match that was to watch was live with defending champions, St. Helens. at half time the Catalans were winning 7 - 6 but yet again a win was dropped and left to the better team to win the game. The match was stop, start but 12 seconds in Willie Tonga got knocked out on his First Utility Super League debut. A highlight of the game was that 65 of the thumping tackles were made by James Roby and 40 were also made by Joshua Jones. The Wolves only got started in the 25th minute of the game, but what a 25 minute start they had with more than half of their tries coming fifteen minutes from half time! 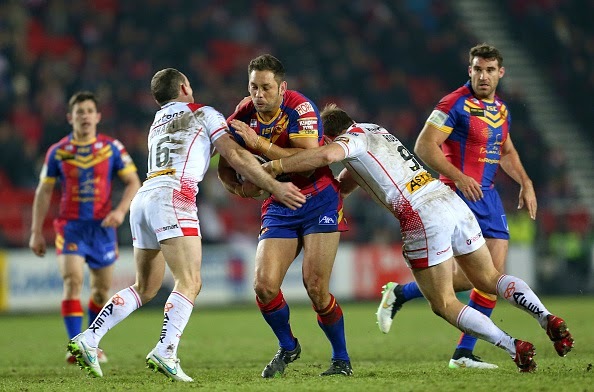 A massive 38 tackles were made by Ben Westwood and Ben Jones-Bishop scored his first try for Salford after joining from the Leeds Rhinos in the winter of 2014. Wakefield came from 16 - 6 down to get 3 late tries to rise above their cross-city rivals, the Castleford Tigers in the dramatic Yorkshire-Derby encounter. Castleford were comfortably winning with new signing Denny Solomona scoring 2 tries on his debut, that was the only article the Tigers made because noisy rivals Wakey made some noise at the track end and rattled the buses on the way back to the little town across the M62. Tackles were hard but not as hard as Carney who made a whopping 77 tackles on the Wildcats offence in just 80, yes eighty minutes. The Giants took a Giant killing at home to the unlikely winning opponents Hull FC, 19 - 0 was the outcome and the rusty Huddersfield Giants have now lost 4 opening weekend games in 4 years. Barmy. With just the 6 points at half time, Hull new boy Marc Sneyd from Cas, simply did not take long to get 1 try and 3 goals to his name on his debut. 19 nil was the end outcome of the game and it was the only game that saw one team finish the game with no tries, goals or drop goals. An incredible winning performance saw Hull FC go top of the pile after week 1! The Rhinos gradually broke out of the cage to beat the slow starting Hull KR who haven't managed to win an opening league game for 2 years. Even though Hull KR had a 24 - 16 half time lead it shortly lost with Leeds making the second half as easy as they could for themselves by giving Kevin Sinfield 6 goals in the first game of the season and in his 10th season at the Rhinos. What a player the Leeds captain is turning out to be. The first weekend of the First Utility Super League did not lack tries, tackles or points, but how will next week live up to it? 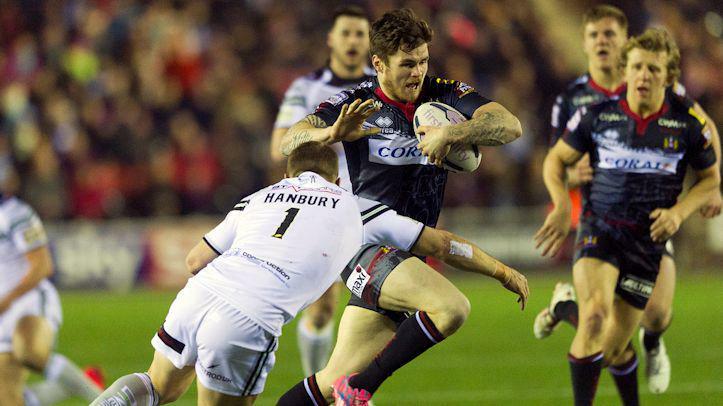 Recap for the opening weekend of the 2014/15 Rugby Super League season, featuring St Helens hammering the Dragons.